Managers at Zion National Park are considering a single reservation option for visitors to enter and explore the park and another option that would allow tourists to enter the park at a specific time to visit specific sites. Zion National Park is the fifth-most-visited park in the national park system. People line up at Angel’s Landing in Zion National Park, Utah. The sweeping red-rock vistas at Zion National Park are increasingly filled with a bumper crop of visitors, and now park managers are weighing an unusual step to stem the tide: requiring tourists to make reservations. 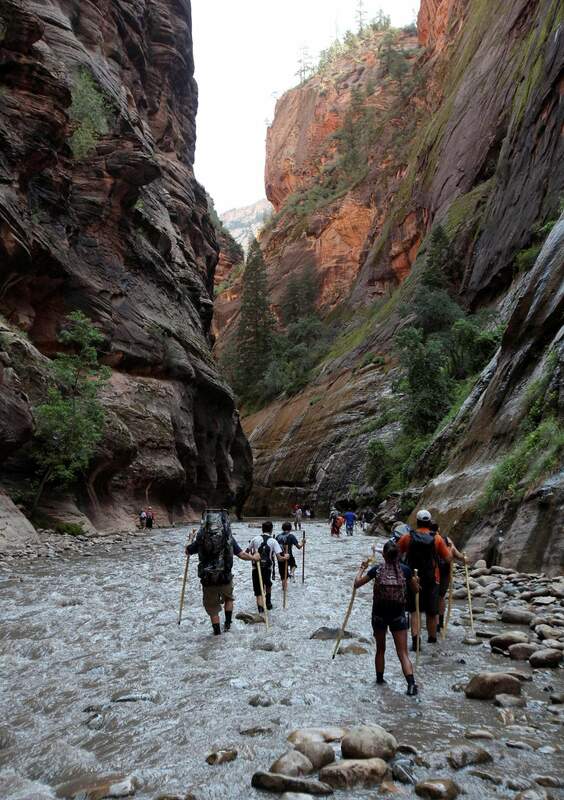 Hikers wade through the cold Virgin River along the Narrows in Zion National Park, Utah. Because crowds at Zion National Park are overwhelming the landscape, park managers are weighing an unusual step to stem the tide: requiring tourists to make reservations. The sweeping red-rock vistas at Zion National Park are increasingly filled with a bumper crop of visitors, and now park managers are weighing an unusual step to stem the tide: requiring tourists to make reservations. It would be a first for a U.S. national park: requiring reservations to get in. 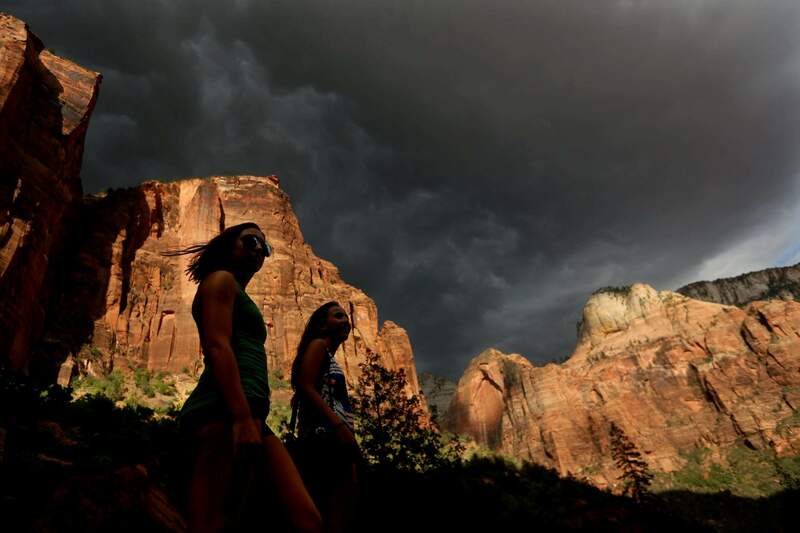 But it’s an option that Zion National Park is considering to manage an overwhelming surge of visitors to its sweeping red-rock vistas and canyons in Utah. Zion, which welcomed 4.3 million people last year, is weighing online reservations for those who want to explore its main canyon. 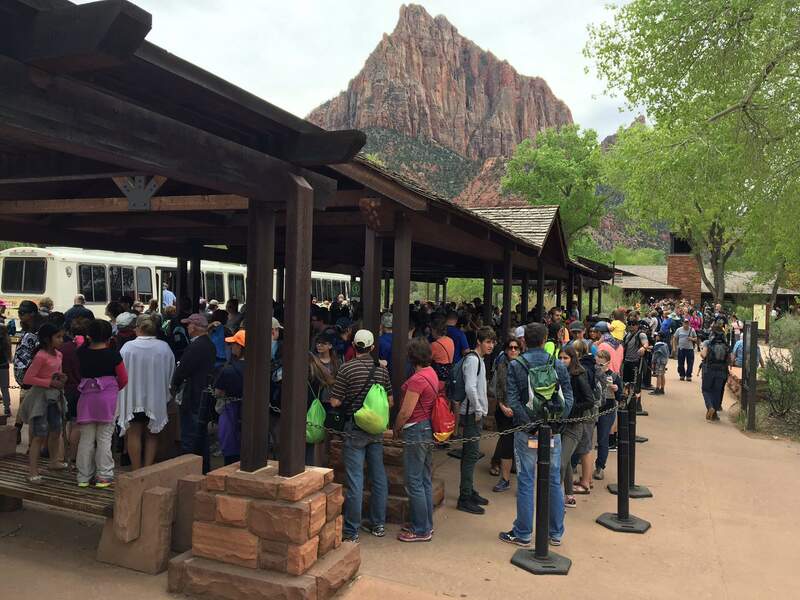 National Park Service rangers struggle to cope with overcrowded tour buses and alleviate damage to Zion’s natural wonders, including soil erosion and human waste near trails. People without reservations could pay an entrance fee and drive through the park, but they couldn’t stop to hike or picnic. “We have to do something,” said park spokesman John Marciano. 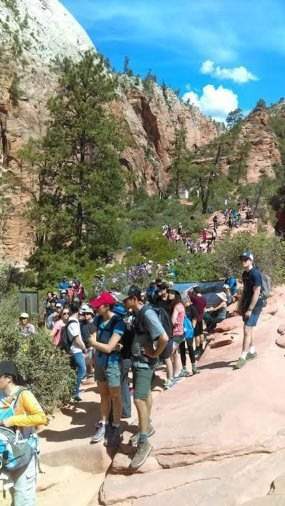 With limited budgets, Zion’s Park Service rangers routinely see long lines and plants trampled by visitors who also have cut some 30 miles of their own trails. Zion isn’t the only U.S. national park with swelling numbers of tourists, and at least two national parks, in California and Hawaii, are testing more limited reservation systems for parking. Overall, more than 330 million people visited U.S. national parks in 2016, a record. Visits were bolstered by the improving economy, cheap gas and marketing campaigns for the National Park Service’s 2016 centennial. 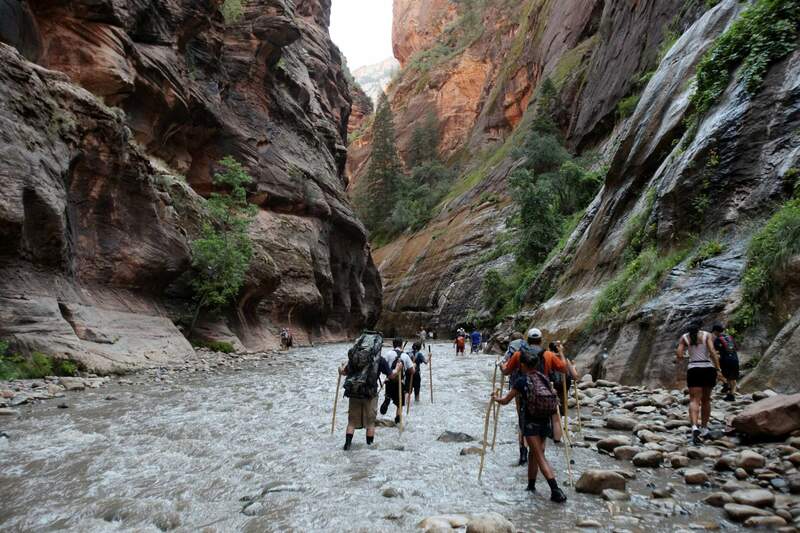 Zion is the fifth-most-visited park in the national park system. It’s particularly susceptible to overcrowding because many of its iconic cliffs and trails are located in the narrow, 6-mile-long Zion Canyon. The park already urges visitors to take a shuttle between March and November. After a series of public meetings, Zion rangers are proposing an online reservation system, similar to the way campsites are reserved now. While certain hikes and activities require permits or reservations, the new system would apply to the entire main corridor of the park. The number of reservations would be based on capacity, would vary by season, and could fall somewhere between a manageable 10,000 people a day and an overpowering 30,000 people a day, Marciano said. One option would require a single reservation to enter and explore the park. A second would allow tourists to enter the park at a specific time and visit specific trails, like Angel’s Landing, a popular narrow cliff walk. A third option would be to make no changes. But the park says that would allow continued degradation of the environment and the hours-long lines. Public comment on the plan runs through Aug. 14. It could take at least two years before officials begin phasing in a reservation system. Making reservations to visit a public park could be frustrating, especially if tourists who travel across the country or from abroad to see Zion’s spectacular vistas find themselves shut out if their plans change and they miss their time slot, said Darren Shipley, a video producer from Nashville, Tennessee, who’s visited Zion. “I think there needs to be some flexibility,” Shipley said. 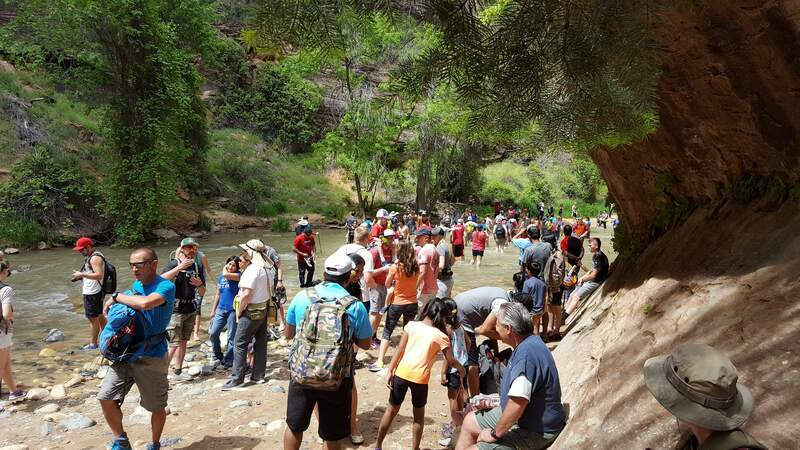 Initially, the idea could discourage visits but would ultimately keep traffic manageable, said Roxie Sherwin, director of tourism for southern Utah’s Washington County, which includes most of Zion. “When people are vacationing, they make reservations, so I don’t see that as a big deterrent,” she said. Her office has suggested that tourists visit attractions beyond Zion’s main canyon as the park started getting crowded. A few other national parks are trying out similar plans to manage car traffic. Haleakala National Park in Hawaii started requiring reservations in February to drive up to Maui’s tallest peak to see the sunrise. Officials said vehicles spilling out of parking lots were a safety hazard and that throngs of tourists were trampling sensitive habitat. The system, enacted on an emergency basis, has dramatically reduced crowds. Authorities are studying whether to keep it. In California’s Yosemite National Park, managers are letting people make voluntary parking reservations for prime locations in August. The system is intended to reduce traffic and help tourists plan their visits.